I am thinking of making an outdoor area where my CAG can get some sunlight and exercise his wings. I found a 10 ft X by 10 ft dog kennel 6 ft high with a gate. It has 11.5 gauge wire. Costs $199.00. I would place fencing over the top to enclose it. Wood or small tarp over one end for shade, extra pieces of fence around edges of gate to secure gaps. For perches I know metal would get to hot and would could cause foot problems so I am thinking of using pvc. Any thoughts or suggestions, anything I'm not thinking about? Yes, there is and it's a biggie: heavy metal poisoning! Dog kennels are not safe for parrots. Any ideas on what else to do without much money? I am open to suggestions. The biggest problem with building an outdoor flight or aviary of any size is the metal components used to make the enclosure. Most of the hardware cloth or other wire, such as chain link that is normally available to the DIYer is not suited to use with birds due to the types of metal used as well as the coatings on them. The majority of these products are made of galvanized metals, which is to say that it contains a huge amount of zinc, which is highly toxic to birds. ideally the way to go is with stainless steel wire mesh or even aluminum wire mesh, both of which are expensive, and usually difficult to find. I have found some all aluminum chain link fence mesh in 5o foot rolls, a 2 inch mesh X 120 inch high ( 10 ft.) runs about $921.00 plus shipping and you can usually find the hardware locally to put it all together. Stainless steel is even more expensive to get. So far in chainlink I have not been able to find any smaller of a mesh and feel that a 2 inch mesh is too big for most of the birds that we have as all of my birds would be able to get their heads through this size of mesh, the largest bird that I have is an Amazon. Despite the cost of the materials, I am still looking and hope to be able to build an aviary for my birds sometime this year. I am glad that you made this post as I have been lax in looking for materials this winter and need to make this a higher priority now that spring is in the air. Allow me to have a couple more days and I will post an up to date list of links to materials for this project. I was thinking of a screened enclosure to keep bugs off them and reinforced on the outside with chicken wire to keep the birds of prey off of them. I don't intend to leave them out at night. Their food and water will be inside so I expect them to just come in at night too. I think it would depend on the birds you are wanting to contain, a screen would never keep my African Grey in. Construction of a flight or an aviary is not only a matter of containing the bird or birds in question, it is also about their protection from various other factors such as excess sun, wind and/ or rain. 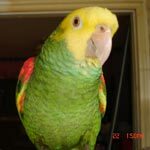 It is also about protecting them from unwanted intrusion of other animals into the space that your bird/s will utilize and because of this how you will use the flight/aviary also must be considered in its design and construction. For example you can be more lenient in the design if you will always be in the aviary or nearby keeping watch on your bird/s Than you would be if you may not be present at all times to prevent a dog, cat or other creature from digging underneath the enclosure and gaining access to your bird/s. Also additional precautions must be taken if your bird/s might be left in the enclosure overnight. How you are going to clean and maintain the flight/aviary must also be taken into account. If all you are after is a way to get your birds some sunlight and fresh air for an hour or two with you being on hand to protect your birds and watch over them then you can use almost any fenced in enclosure that will also provide shade from the direct rays of the sun and place extra cages for them inside the enclosure. But if you are like me and may need to go to town and be absent so that you can't protect them than you must consider all of the possible ways that they could be injured or worse. Smokey wrote: I think it would depend on the birds you are wanting to contain, a screen would never keep my African Grey in. That is why I would reinforce the outside with wire. I am more afraid of hawks than any ground predator. They could come in if the sun was too much. I would have a crawl through door outside on the aviary to clean inside.